How I Became a Hare Krishna: Bhakti Yoga Dasa ~ The Toronto Hare Krishna Temple! For many devotees, the one question that goes unanswered is: “What can I do to contribute?” Often times, newcomers are surprised by the amount of enthusiasm devotees show towards doing service at the temple. And they are always eager for more. Devotees are also found agonizing over their contribution; thinking that it is not significant enough. Bhakti Yoga Das is an example of a devotee who made the best of all the opportunities he had and incorporated Krishna Consciousness into his life in the best possible way. Bhakti Yoga Prabhu, formerly known as Bhisham Prasad Mishra, was attracted towards Krishna Consciousness at a very young age. He had a cousin who was already in the movement, and he received guidance to help reach his destination. He was living in Guyana, South America, when he began what would turn out to be a divine journey in Krishna Consciousness. His cousin, Butadi Prabhu, had previously lived in New York for a while, where he was initiated by His Divine Grace A.C. Bhaktivedanta Swami Srila Prabhupada, the founder of our Hare Krishna movement. Through association, Bhakti Yoga Prabhu was inevitably pulled towards the temple. And on his first day, he had the opportunity to read the original Krsna book. That was his first introduction into Krishna Consciousness. And after one taste of the nectarine knowledge, he simply couldn’t get enough. He started going regularly to the temple in Guyana, every day after school, and sometimes he would even stay overnight on the weekends to attend the morning 4 am arati (morning service). 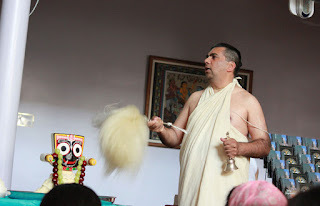 He learned how to dress and follow the customs of a Vaishnava, which led to his very first sankirtan outing (outreach through book distribution and kirtan). In 1980, he immigrated to Canada with his family. He originally lived in Hamilton, Ontario. On weekends and holidays, he would visit the Toronto temple. Eventually, a devotee from the temple used to come visit them. This was the start of a Sunday program in Hamilton. In June, 1982, while living at the temple, Bhakti Yoga Das met his eventual spiritual master, Gopal Krishna Goswami for the first time. Later on, in September of the same year, he got initiated (was formally as a student of his guru). As one thing led to another, his thirst for spiritual bliss increased. He became increasingly inclined towards visiting India, and finally, with the blessings of his guru, he went to Vrindavan for the first time in 1985. During the six months that he spent there, Bhakti Yoga Prabhu learned Deity worship; a skill that would come a long way in the future. After his lengthy stay in Vrindavan, Bhakti Yoga Prabhu returned to Toronto, where he helped in bookkeeping and used his newly acquired knowledge of Deity worship. In 1989, he returned to Guyana, where he once again was greeted by Butadi Prabhu, who was now his Siksha Guru (spiritual guide). Taking into consideration the fact that he was still young, Butadi Prabhu arranged his marriage with Jahnavi Devi Dasi. After three years, Bhakti Yoga Das and Jhanavi Devi Dasi were married in Canada. Haridas and Neela Madhava were soon new additions to their family. The couple wanted desperately to find a spiritual school for their sons. They traveled to many North American temples in search of a gurukula (Vedic school). Finally, they found a good gurukula in Mayapur, West Bengal, India. The family moved there, and lived there for about five years. During their stay there, Bhakti Yoga Prabhu served as a managing director at an NGO called Shri Mayapur Vikas Sangha. They got grants from various countries and organizations for setting up primary schools, clinics, and training sessions for women in the villages near Mayapur. At the end of five years, the family returned to Canada, where he resumed his service as a Pujari and even conducted a few seminars on Deity worship. He also began assisting a few devotees who wanted to start a temple in Scarborough. When the temple was established, Bhakti Yoga Prabhu was the acting Temple President. Currently, he is working on establishing a temple in Milton with some enthusiastic devotees who are living there. He says that he hopes to continue spreading the Krishna Conscious movement, “I simply hope to be instrumental helping to make Srila Prabhupada’s vision a reality!"